Putting the "cool" back in school. But to showcase this level of ignorance and/or carelessness in PAINT and in front of a SCHOOL is both hilariously ironic and disheartening. Where are the standards? Who is double-checking? Is our children learning? It reminds me of this photo of me printed in a library-related newsletter a couple of years ago. 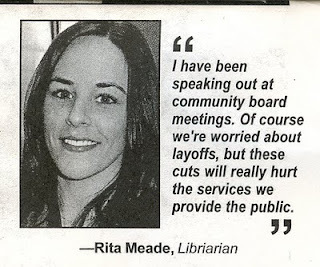 If you can't spell "librarian," can you really support librarians? Only time will tell. Last night, right before the library closed, I was chatting with a coworker while standing next to the aforementioned back-to-school display. 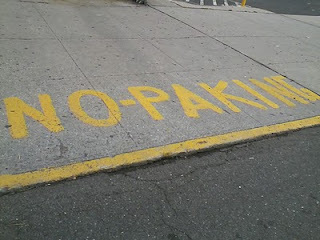 My coworker looked at the "Shcool" picture and commented, "You know, the driveway outside the library says "No Paking" instead of "No Parking." "No way," I said, my voice filled with skepticism. "Way," he replied, giving me a solemn look. I've worked here over a year and used the driveway hundreds of times. How did I not notice this before? So, when the last patron was gone and the security guard was ready to lock up, I left the building and walked over to the driveway. Lo and behold, there it was: "NO PAKING." I shook my head. How could this have happened? This is a LIBRARY, dammit! We're supposed to set an example! Public libraries: paving (ahem) the way to literacy. I guess no one and nothing is immune from poor spelling and bad grammar, not even educational institutions. Should we all just throw in the proverbial towel and resign ourselves to the Idiocracy, or continue in our quest to make the world a more intelligent, literate place? Something to think about...er, I mean, something about which to think. Personally, I blame errors like these on deadlines. Doesn't it seem like we're always rushing, rushing, rushing? On to the next deadline! Examples like your No Paking one illustrate the importance of approaching work with fresh eyes. Sometimes, the brain sees what the brain wants to see. When you're rushing to finish the work, you just increased the odds of never noticing the error. Which is worse: bad spelling, or bad grammar? Perhaps the painter was from Boston. 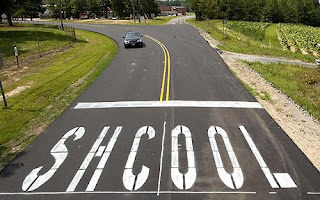 The school sign sounds like it was painted by Sean Connery. "...it's a merely test to see if you're all paying attention." Patty, you are far more optimistic than I will ever be. The curb outside the high school where I teach says "LANEFIRE."